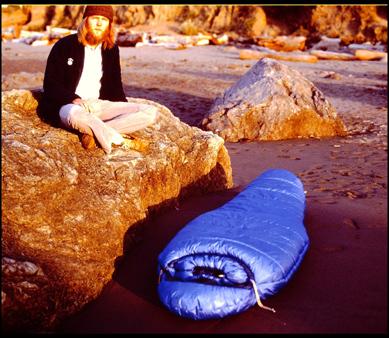 Moonstone's story carries on the fine tradition of three of the earliest gear pioneers--- Holubar , GERRY and Warmlite, . 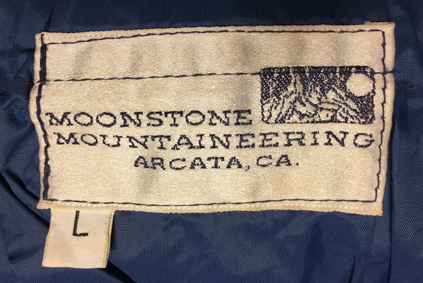 Moonstone began as a 2-person custom outdoor gear company hidden away in the remote coastal region of extreme Northern California. Like Stephenson's Warmlite, Moonstone's story began in a trailer. The trailer was parked at Moonstone Beach. In the picture, we see Fred William's partner Nikki hard at work in their small trailer, with the dog nearby. And in the second picture, Fred Williams proudly showing off one of his finely-crafted down sleeping bags; it's an innovative design with not only a down collar but covered with the newly-introduced miracle shell fabric, Goretex. Unlike the many pioneering companies that sprouted up in the city environments of Boulder, Seattle, Los Angeles or the Bay Area, Moonstone appears to have drawn its energy from a direct day to day experience of being right in a wilderness-like locality, in this they were similar to Rivendell at the base of the Teton Range. Moonstone began business in Arcata, California in 1976 or 1977. It derived its name from a very popular beach just north of Arcata called Moonstone Beach, which features some good bouldering (climbing)..In fact, the Company's earliest days were spent in a small trailer overlooking the Moonstone Beach..The principals involved were Fred Williams and his partner Nikki; however, there was a very close relationship between Fred and Chuck Kennedy, then the head designer, maybe part-owner of Blue Puma (and later of Downhome). 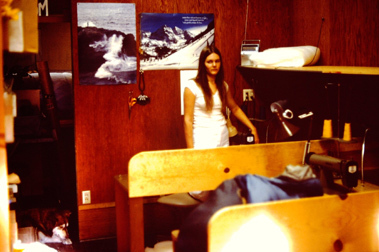 In fact, the early Moonstone and Chuck Kennedy shared building space for quite some time..(later, the space was also shared with Kokatat).... Moonstone was in Arcata for an estimated 12-18 years. At some point, Mr. Williams sold to a conglomeration called "OIG" (Outdoor Industries Group), that had been formed with the help of Hap Klopp of North Face fame. That did not work out well and was brief, then Moonstone was picked up by Espirit and moved to San Francisco, where again it did not do very well. Then, Espirit sold Moonstone to the latter-day remanent of GERRY under AMEREX Corp., and then both old companies were based in Seattle. Moonstone by now was seeming a real orphan and its new designs were another apparent failure. Soon AMEREX sold Moonstone to an old-line company named "Pacific Trails," founded in 1945 in Seattle, but this new owner only lasted about one year. (See my section on how this type of corporate acquisition has affected another classic gear company, The North Face). Please Note: All Material below, and in all my "History of Gear" webpages, is copyrighted, and no usage of my material is permitted unless explicit permission is granted by me, Bruce B. Johnson, owner of OregonPhotos.com. Contact: brucej@Oregonphotos.com -- Portions of this material are from Andrew M., who was heavily involved in the start-up days of Moonstone, Blue Puma and Downhome. The two pictures of Fred Williams and Nikki are from a contribution to my blurb on Facebook called "The History of Gear Project." If you were involved with one of the old-line, vintage gear companies and have a story to tell in these pages, please contact me soon. July 11, 2006 Reader Update on the fate of Moonstone--- Alan, my reader, directed me to a press release from one of the World's largest outdoor clothing companies, Columbia Sportswear (founded in 1938, and based in Portland, Oregon). The press release was dated 3/30/2006, and stated that Columbia had bought up the bankrupt Pacific Trails, thereby acquiring the rights also to Moonstone. A quotation from the Release, "...Columbia Sportswear Company manages a portfolio of outdoor brands including Mountain Hardwear&REG;, Sorel&REG;, Montrail&REG;, and Pacific Trail&REG;. To learn more about Columbia, please visit the Companys web site at www.columbia.com"
Update: early 2019. When you go to the URL of www.Moonstone.com, there is nothing there. If you go to the main Columbia Sportswear site, there is no mention of Moonstone that I could find. 1. SLEEPING BAG HOODS-- In the general history of sleeping bags, remember that it had been a great leap forward when early designers had dissected the flaws of the old-fashioned flat bags with the square tops and no hood and then created the modern form-fitting "mummy bag" shape with integral hood. Moonstone saw that there were problems with the integral hood design-- it doesn't function very efficiently when the sleeper rolls over and buries his face in the hood, breathing moisture into his bag; additionally, cinching up the bag tight enough during really cold winter conditions is problematic, and many sleepers simply feel too clastrophobic to cinch the hood small enough to truly minimize heat loss from the vulnerable head and shoulders area. Some innovative designers have tried to cope with the problem by means of a "down collar" to isolate the leaky hood area from the main portion of the bag, and that, insofar as it goes, is a good solution and works well (I have a very comfortable down collar on my Feathered Friends bag, for example)......But Moonstone experimented with alternatives, such as in their "Modulus" bag (see below). ARCATA, CALIFORNIA-- The Birthplace of both MOONSTONE MOUNTAIN EQUIPMENT and DOWNHOME. (img, "Strange Bedfellows")... These two custom gear makers both sprang up in the late 1970s in the same small, isolated Northern California town. (originally Moonstone's name was "Moonstone Mountaineering, INC.")...... Was this dual birth just a coincidence? 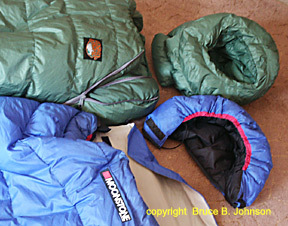 If one studies the design features of DownHome bags, especially the DownHome Modular Sleeping System, and then opens an early Moonstone catalog, they will see products like the Moonstone Spectrum II bag with a removeable hood, or the Modulus with a removeable hood, built-in sleeping pad and no down at all on the bottom(Modulus is the blue Moonstone bag in image)... Such relationships are unlikely to be purely accidental; after all, Chuck Kennedy of Downhome shared the same building with the early Moonstone! (the folowing link is to the official Moonstone.com website, which appears to be now defunct-- Moonstone Mountain Equipment)..... Mr. Kennedy began Downhome in about 1978 or 1979, and later moved it across the border into a small town in Oregon (Moonstone began in about 1977, a year or two before DownHome). .
Warmlite pioneered the concept of modular bag "systems," and also pioneered the use of the double zipper draft flap, and the concept of bags with no down on the bottom and built-in pads which the sleeper cannot roll off of-- all more than ten years before DownHome bags. Main Page: Essays and pictures about the Pioneers of the Outdoor Gear Revolution, 1935-The Present, well over 45 pages, six History of Gear books published, and ever-growing!